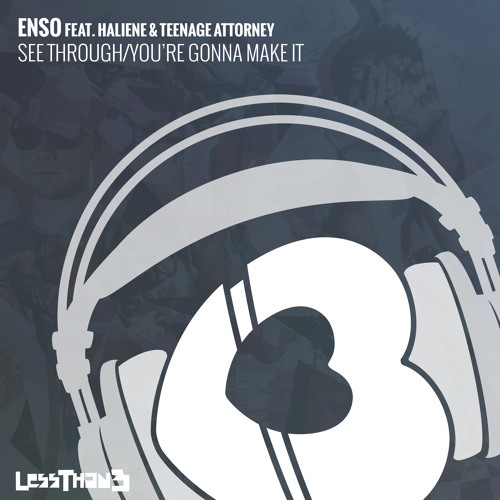 LessThan3 kick off 2015 with a release from San Francisco based duo Enso and their See Through EP. Featuring two tracks with two distinctive vocalists, ENSO provide some much needed big-room energy to get you through the long winter months. Enso are producer/DJs, Derrick Calloway and Seth Warrick, a duo who broke into the scene in 2010 with their award winning remix of Sleigh Bells hit single Run the Heart. Enso clearly love what they do, and their energy never fails to infect the audience, making them the perfect fit for LessThan3. Title track See Through features vocalist Haliene and is a groovy piece of big-room house, complete with a catchy hook and some clever production techniques. Perfect for peak-time sets, the enormous break, sing-along vocal and explosive drop is bound to get a crowd jumping. On the flip-side, Teenage Attorney provides an ethereal performance on Youre Gonna Make It, which features a dark and gritty bassline, emotional build and yet more catchy-hooks after the drop. Its a track that combines raw emotion and songwriting, with full-on production, just perfect for festivals.